I saw the photo below on my Facebook newsfeed today and I'm glad to see more and more of such movement(s) in the world. 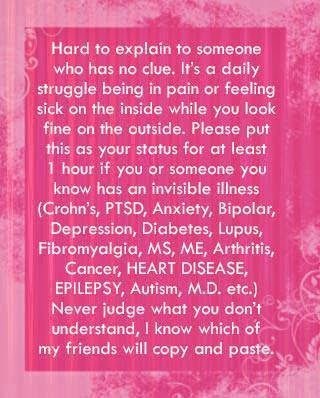 Needless to say, I shared it and I wrote, "There are tons of 'invisible' illnesses out in the world. We should not judge others by what we have/ don't have, learn to accept that these illnesses are a struggle and that it takes a lot of self control for people to NOT whinge and whine about their illness(es) to others constantly." As someone who has endometriosis and clinical depression, which is linked to my endometriosis (I shall now shorten it to 'endo'), I can really relate to how it is a struggle to smile to the world while your insides are just eating away at you. Don't get me started on the head trip that goes with every low when depression hits you nor the extreme pain I go through sometimes whenever Mother Nature visits. The worst thing is that these illnesses are chronic. They will reoccur again and again, with almost no cure. Just prevention of symptoms or just making these symptoms milder so that they do not become stumbling blocks. I get a bit offended whenever people talk about my weight and my weight gain. It is a side effect of endo (people with PCOS can relate) and it takes me 3x the effort to lose the weight. I'm already happy that I've maintained my weight without it ballooning further. I can't stand it when family, friends and some colleagues talk about my food intake as if I'm consuming 2,000 calories a day. I've checked. There are days and weeks when I meticulously note down all the food that I consume and guess what? I clock in at 1,500 calories on average! Sometimes 1,200 calories too! However, nobody sees this and whatever they assume, they believe. I still can't get over the fact that one of my directors skipped me when she was offering biscuits to everyone in the office. Another thing about endo is the incredible amount of pain it brings and it's not constant. It comes and goes like a bad diarrhoea that visits you without the accompanying runs. You're so exhausted despite not doing much and you just can't concentrate on anything else except a good book/mindless games/how soft your pillow is. Whenever this happens, I can't help but take a sickie. But of course...a lot of colleagues think that I'm skiving or complain that I'm "always not around/always on medical leave". Some colleagues even go so far to say that I only work 3 days a week (I wish!). Best that I've heard so far: "she has so many days of medical leave meh?" Nope...I still have the same amount of leave as anyone else in the office and I do 3x the amount of work in the same amount of time. That's for efficiency y'all naysayers! Honestly, people like me aren't asking for sympathy nor empathy. We just want all of you to be less judgemental and more understanding.